The Go Around is an advanced shuffleboard shot where the puck curves around another puck. This is an advanced technique that can make it more difficult for your opponent to outscore you or put you in a bad position. On the contrary, the go-around allows you to toss one more arsenal into your bag of tricks (cue the evil grin). 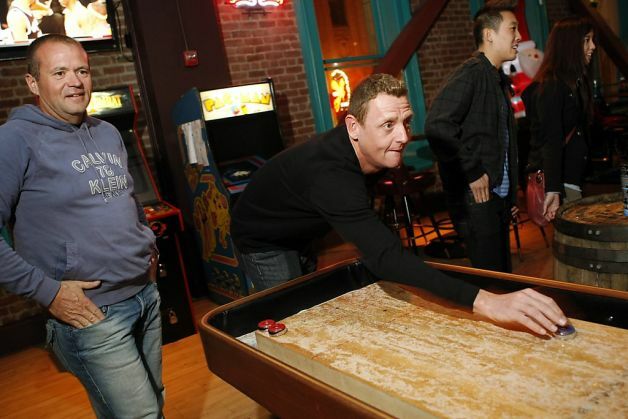 Before you begin, it’s a good idea to review the fundamentals of shooting a shuffleboard puck. Make sure that you have the basics down before you move on to the advanced techniques! In order to make your shot curve, you have to add some spin, or “English,” as some call it. The more spin you add to your shot, the more the puck will curve as it nears the edge of the table. At the same time, there are other factors that can come into play. Proper waxing and alignment of your climatic adjusters can have a large impact on the way that your puck interacts with the playing surface. If these aren’t right, you will likely lose your mind. Mastering the go-around on a less than prime playing surface can be frustrating. The slightest imperfection can lead to a bad shot. Now that we have that out of the way, back to the go-around! Use your bear claw to grip the puck. Don’t remember how that works? Read this. Place your thumb along the rim of your weight and the index finger on the adjacent side. The trick is to rotate both your thumb and index finger toward your body during the release. Some people find it easier to spin the puck clockwise while others find a more natural feel going counter-clockwise. Do what feels most comfortable and natural for you! If you’re not having much luck, there are a few things that will cause your shot to travel in the wrong direction. It’s likely that you are adding too much/not enough spin, releasing too early, or releasing too late. You’ll have to work on the timing of these 4 factors until you have it down pat. The go around can be a great way to position yourself for the win. You can use the go-around to curve your puck behind the opponents scoring puck to outdo them by just that much. It comes in handy when you don’t have a clear shot to the scoring zone. You’ll have to maneuver your weight around others to make your puck land in a sweet spot. There’s also the “Go Around Hanger.” This is when you shoot a go around shot and make it hang off the edge of the table. Like a normal hanger, this over the edge shot is awarded 4 points. Once you learn how to make your shuffleboard weight curl, you can try to add the right touch to make it hang off the edge of the table! This is one of the best ways to maximize scoring and put your opponent in a hard spot. It’s always fun to watch the pros do it. Maybe it will inspire you or entertain you for 3 minutes and 55 seconds. Either way, it’s a great video to check out. Billy Mays is a 25 time World Champion Shuffleboard Player who can teach you a thing or two. Pay attention to his movement, posture, and the technique he uses to curve shots at will. Billy adds spin to make some of the most impressive shots. Watch and learn, watch and learn.